I love this item! I use it all the time. I initially thought I needed new knives, but in actuality, I just needed to sharpen them. If you are considering purchasing new knives because they seem dull, save money and try this knife sharpener first. 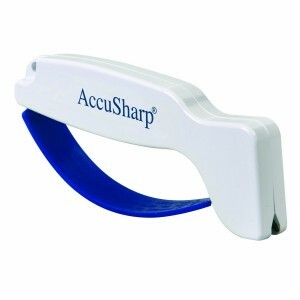 You can head to Amazon.com to snag the AccuSharp Knife Sharpener for only $8.49 (Regularly $13.99) with FREE shipping on orders of $25 or more. Looks like I am not the only one who loves this item, it has over 1,100 reviews with an average rating of 4.6 out of 5 stars. If interested, I’d act quickly because I do not know how long this bargain will last.